LVM is used to create logical partition that can span data between multiple physical hard disks. 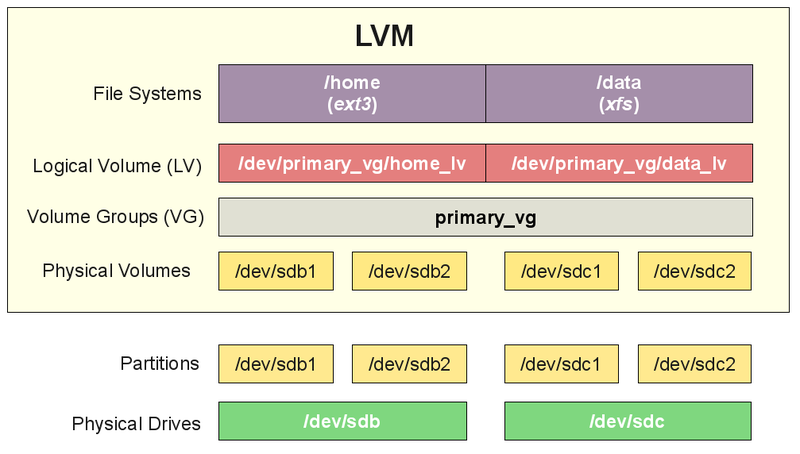 Online LV and VG resizing, raid volumes, mirror and strip are some features of LVM. A well documentation about LVM can be find in Logical Volume Manager (Linux) . The follow image describe very well what is the relationship between LVM components. - Physical driver are divided into Partitions. - Physical Volumes are made from Partitions. - Volumes Groups contains Partitions. - Volumes Groups are divided into Logical Volumes. - And Logical Volumes are base to File Systems. Use fdisk -l to list the Psysical Drivers available to use. (the command bellow is truncated). Use fdisk to create a disk partition. Building a new DOS disklabel with disk identifier 0xd968e05e. Use pvcreate to create physical volumes. This will associate the physical partition we made before to a Psysical Volume. We can use vgcreate to create the volume group. A single volume group can contain one or more physical volume. The command bellow creates a VG called oracle_vg with two physical volumes /dev/sdb1 and /dev/sdc1. The vgdisplay can be used to list all VG and VG attributes in OS. The follow command (lvcreate) can be used to create a LV called ora_home_lv with 12G.